The UK has been the birthplace of some of the most forward-thinking, game-changing, and important bands and musicians for years. One can’t pinpoint exactly what makes it such fertile ground for music, but UK musicians never fail to impress. BIMM, a music school consortium of six independent colleges (including one located in Brighton), can be considered one of the many nests for British musicians. Its recent graduates include Grammy-nominated James Bay, George Ezra, Tom Odell, and The Kooks. Enter The Island Club. 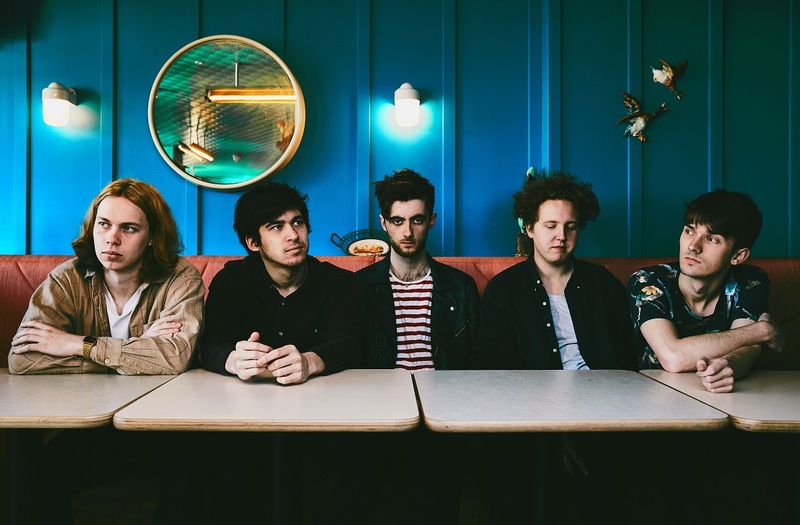 Composed of Michael, David, Sam, Julien, and Barney, four of whom just graduated from BIMM, the band has already shown promise and received critical acclaim, despite having only released three songs. Their most recent single, “Let Go,” has hit over one million listens on Spotify – and it was released only three months ago. The Island Club’s music is a mix of psychedelia, pop, dance, hints at various other genres, and grabs you from your first listen. Atwood Magazine had the chance to chat with the five boys a few weeks ago, and discussing their musical influences, having undefinable music, being categorized as a boy band, and what’s next for them. Atwood Magazine: I know four of you went to BIMM, what was that experience like? Michael: It was cool. It’s a platform for us to meet one another and come together. At first we just started jamming out in dingy university bed sets and that evolved. BIMM was a platform for us to meet. But the work you put in outside of BIMM is definitely the most important part of it, working really hard, which we’ve done. Your band name changed from Vacant Age to The Island Club - what drove that change? Did your sound change alongside with it? Sam: Vacant Age was really an entirely different thing and a completely different line up. I think the idea of the band was entirely different, and I think also we had come to the conclusion that Vacant Age was probably one of the worst band names anyone has ever heard. There’s a place in Bath called The Lonely Island Club, and I saw it when I was with a friend and he was like “The Island Club would be quite a cool band name,” so I literally knicked my friend’s idea into ours. But I think the lineup change and the sound is hugely different to what it was, particularly with the new stuff we’re doing, it’s a much better fit. And there’s a more cohesive idea behind what we were doing and where we were trying to go with it, we thought it was a good representation of at least where we were at that moment in time. England has been the birthplace of many music legends and today continues to be a place where you can find amazing music. Are there any British artists you admire, both old and new? David: Yeah, loads, past and current that we look up to. We are really excited to be part of the music industry and scene in the UK. At the moment there are so many bands that are really killing it like The 1975, Two Door Cinema Club, yeah, it’s pretty cool. Julien: I like the local bands in Brighton. Barney: I love James Blake. I love your taste! Any other artists serve as inspiration? Michael: Tame Impala, Grimes. Grimes is wicked. Julien: We all have separate influences as well as individuals. We all like the stuff that is coming out of Australia at the moment, actually. Personally, there’s a little electronic duo called Klo that I’m really liking. Barney: I don’t know. I’m not sure. Michael: I think he’s English. We’re back to England, now. I’ve just gotten into CHVRCHES as well, so that might be coming in in the next batch of songs. Sam: Another big British band that we really like is Peace. Especially the second album. I’m a huge, huge fan of Peace, really like what they’ve done with it. I think the really great thing about the UK is that there’s a huge variety of music, particularly in Brighton, it’s a really good pool of underground music which grows out and expands. I think we’re kind of a little bit spoiled for choice. Being a band made up only of men can bring about the title “boy band,” which some fear and others embrace. What’s your take on this? Michael: We are definitely, 120% a boy band [all laugh]. No, no, I don’t think so. Even though we write these pop songs, when you do that sort of music it’s quite easy for people to label that as a boy band, but we really want to keep it as band-y as possible because it is a general band setup. Do you guys – if someone came up to you and said “are you a boy band?” what would you say? Sam: How other people want to define it, if it makes sense to them. Julien: We’re just gonna do our thing and then whatever people think that we are, that’s what we are. Barney: Boy bands are probably a bit more polished than we are. I think we still need a bath. We were talking about your influences, and how all of you have different influences, so what’s the songwriting process like? How do all of you balance what you want to work into a song? Julien: It normally starts off with a seed of an idea from either myself or Mike, and then we’ll, as quickly as possible, get it into the rehearsal room so that everyone can sort of get their hands on it, and then we’ll mess around with it. It can be quite a long process because we want to make sure everyone likes the final product, in terms of the sound. Everyone needs to be happy. David: After the initial idea comes into the rehearsal room, everyone comes up with their own parts for it and adapts it to how they do best, so everyone has their own say on their parts and also on the rest of the song as a whole so it comes together as a cohesive unit. “Let Go” has been described as having “therapeutic, sun-kissed harmonies” and “a nice, gnarly nonchalance”. How would you describe it? Barney: I would say it’s synth pop meets more pop. It’s one of our more empty, sparse tracks. It’s kind of pop-y, synth-y, dance-y, euphoric, grunge-y, tickly, these were the first bunch of words that came into my head. Michael: Through the process of writing it we figured out what it should sound like. Sam: I feel like the words you just referred to are probably actually accurate to what we were attempting. Michael: Of course, these were the words that someone with an English degree rather than a Music degree might say. We might struggle. What was the inspiration behind the video for “Let Go”? Michael: We almost made it up as we went on. We had this idea that we wanted it to be very colourful and psychedelic so we got one of our friends to shoot it. Sam: A girl called Martina, I guess her brand name is Ginger Dope, and she does a lot of out there, psych-y, overlay, film-y stuff and I’ve watched a ton of her videos and I love it. And we just let her do whatever she wanted with it. We wanted it to be kind of trippy, almost like a big clash towards the song, we wanted to do something a bit different with it and the results we got were really, really cool. Michael: We almost wanted it to be like abstract art. You can’t make out who the subjects were in it, it’s just so blurry and colourful. Your artwork for “Paper Kiss”/“Sober” is pretty different to that of “Let Go”. How do you go about choosing these? Sam: We usually find artists we really like. We basically like finding cool people to work with and then using their influences and crossing that over. Julien: If we find an artist that we really like, then we assume that their artistic ideas when they hear the music will be sort of in the right direction. So we’re just gonna let them listen to the song and if they have ideas, they’ll show us. That’s definitely what happened with Olivia Savage, she just went straight in. She heard the song and she just came back fairly quickly with an idea and we all loved it. Sam: I said to her that I’d like to see a scene in space and then she created this really cool galaxy swimming pool thing, she was really, really, fun to work with actually. So you don’t have one specific artists you work with for all of them, it’s just random? Michael: Well, like Julien and everyone said, we like working with different people. But with the artwork Olivia did for “Let Go,” I think it gave the whole song and release a really strong image and I think we’re definitely keen to work with her again because she just absolutely smashed it and we got a lot of compliments for that artwork. All credit to her, she was great. Sam: At the same time, it’s because at this point we’re just releasing essentially taster tracks and these two releases that we’ve done, for “Paper Kiss” and “Let Go,” are musically quite different. And if the next thing is different it might be appropriate to go with someone else and keep changing it up and trying to feed as much different content as possible to keep it interesting and fun. At this point we’re quite free to experiment and find a pattern we want to sit into. Olivia was great, I thought she was amazing, but you never know we might find someone else who might do something a bit different, it might be fun for us. About what you said of everything being quite different - if each song is different from the next - what do you think is the one thread that unites each of those pieces to make them a The Island Club song? Julien: I think one of the main things is that we all enjoy it. If we are all feeling it and liking it, and we feel like it’s in the same world, what we think that makes good music – if all boxes are checked that’s the music we should be writing. Barney: If you want genres, I would say – they seem to have a common thread of danciness with touches of psychedelia. 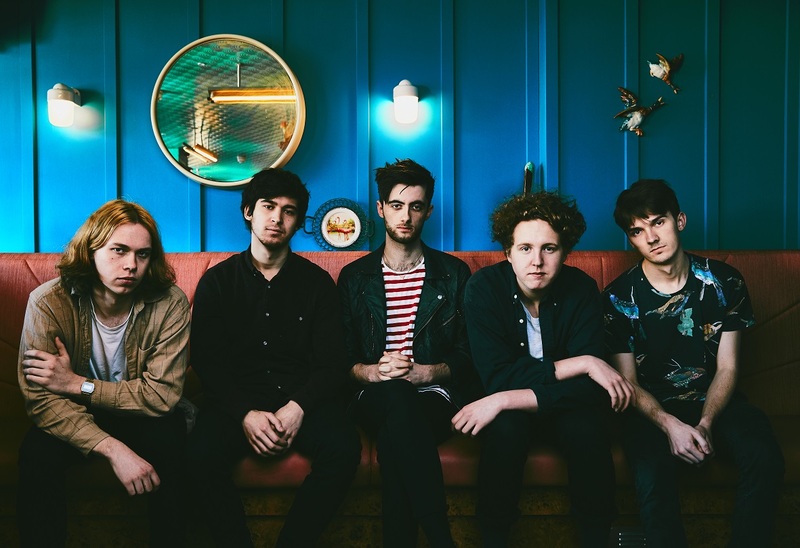 Sam: A mixed bag of indie, synth, pop, rock, it can bounce between a few – more one way or more the other – but it sort of sits in a middle ground between all of them. Michael: We definitely like sounds that make you feel something. “Paper Kiss,” “Sober,” and “Let Go” are really good songs, and they leave us wanting much more. Could you tell us what’s next for you? Sam: We’re about to go into a heavy writing period, four of us just finished BIMM, we were so caught up in getting the degree out of the way we haven’t had the chance to write properly now for a couple of months. So we’re just doing the last couple of shows and then we’ll spend the next couple months writing as much as we possibly can. We’re really excited to release more music, but we’ve always said to each other we’re going to release something properly when we know it’s ready for the world to hear it, I don’t think we’d ever want to rush that period. And I think, we hope, that anyone that is really enjoying the music is happy to wait a little bit longer at the very least because we think the next set of stuff will be really exciting and even better than what we’ve already done. Despite being a new band, you have received extensive praise for the songs you’ve released. Was there one moment which you considered has marked your career so far? Sam: I think a big moment for us was actually when we got to play a venue called KOKO in London, that was a moment when we realised a lot was picking up. We must have played to about 800 people. We can start playing these kinds of shows now. And also seeing the response to “Let Go” on Spotify – I think it’s sitting around 750,000 plays, which for us is huge. We listen to a lot of bands that are massive and don’t get that kind of response, so I think that was kind of a big moment as well when we started to see the numbers going up very quickly out of nowhere. Michael: Since we released Paper Kiss, which was September last year so it hasn’t even been a year, it’s been like go go go. It’s been a pretty mental rollercoaster to say the least. We’ve had some wicked high moments and some kind of low moments. We went to France last year to play a festival in the south of France which was amazing. All the experiences drive us to work harder and write better songs and just go for it. It gives us that determination that bands need to get to the best that they can be because we want to strive for the best. So you have a couple of shows coming up - can you describe what your live show is like? David: We like to make sure that sonically it’s as full and as big as it can be, that’s something we really focus on to really push the sound. You as an audience are hearing the songs exactly how we want you to hear them, and we want to keep it exciting like that. Sam: I think we want people to go away thinking that they’ve had this huge experience and I think that, as we progress as a band, we’re looking forward to taking more control of the live show and adding way more visual elements to it, like really going for it. For us at this point we want the music to be a massive experience to anyone watching it. You are on the rise now - how would you introduce The Island Club to someone who has never heard of you? Michael: Just walk up and point to my face [all laugh]. No, no, I would never do that. I don’t know, when people ask me like “what genre does your band do?” I find it really hard to explain it and want them to listen to the music because the music kind of speaks for itself. Julien: I’d tell them to come to the gig. We want people to check us out and make their own mind about us rather than us telling them what it is. Sam: We also find that a lot of people say that they hear a lot of different elements in the music. They compare it to bands they listen to and we don’t tend to get the same band twice, we’ve had so many different references to different bands, and a lot of them we’ve never actually listened to as a group or individually. So if I would introduce it to someone, I’d probably give them a set of headphones and say “listen to our music” or “come to a show” because I think it’s something you’ll really understand once you hear it or once you see it.